Half inch scale. 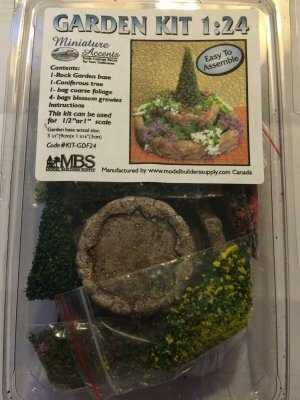 This is a great kit with a rock garden base includes a coniferous tree and the green foliage and assorted blossom material to create a lovely small garden. The base size is 3 1/2 inches X 1 3/16 inches. You will need base paint brown is a suggestion and glue. You can also make this look like a water feature by using blue paint.